I'm trying to refresh my microeconomics knowledge. And I have some "blind spots" I just can't fix. Let's say we have a monopoly on the market. It's usual goal is to maximize it's profits. The point where $MR=MC$ will profit maximizing condition. What is value in this context? I mean, the good $Q$ is being Demanded by customers so value concept should be assigned to it, right? Is there a "value curve" or "marginal value curve" for such charts? Or value is utility, or benefit? I'm confused about the usage of those terms. The demand curve represent the marginal value that consumers put on a good. That is, the marginal value for the $Q$-th unit of the good is the height of the demand curve at $Q$. The total value from consuming $Q$ units of the good is therefore the area under the demand curve from $0$ to $Q$. The net value (i.e. 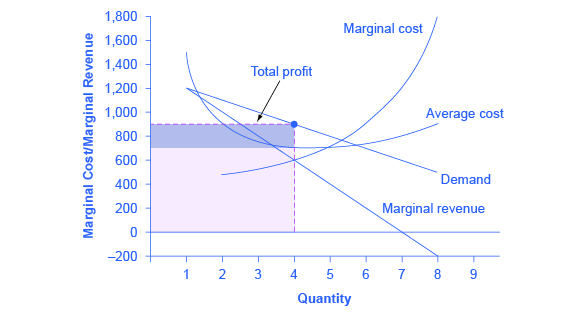 net of cost) from consuming $Q$ units of the good is consumer surplus, which equals total value (defined in the previous paragraph) minus total cost (represented by the sum of the two shaded rectangles in your graph). Not the answer you're looking for? Browse other questions tagged microeconomics value or ask your own question.